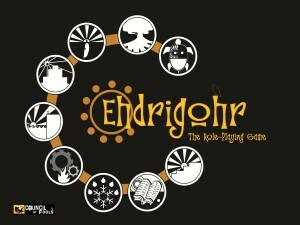 The Nine Nations of Ehdrigohr each have a symbol that represents them. Here is an image that displays all nine symbols. This poster displays the symbols of the 9 nations. Allen, Enjoyed playing Ehdrigohr on Sunday. That title is a mouthful, but you sold us on your system. It was fun. I liked the emphasis on the story which is created by the players.